Emerging market currencies are back in the firing line thanks to renewed trade war concerns and fears over the likelihood of slowing global growth. The risk-off market mood is poised to punish EM currencies for the remainder of the trading week with a stabilizing Dollar rubbing salt into the wound. Indonesia’s Rupiah, the South Korean Won and Malaysian Ringgit among many others are clear casualties of the unfavourable market conditions. With emerging market sentiment quite fragile and sensitive to trade related newsflow, further signs of escalating trade tensions will most likely expose EM currencies to further selling pressure. Buying sentiment towards the Dollar deteriorated earlier in the week after an inversion of the U.S Treasury yield curve sparked concerns over the US economy potentially entering a recession. Market expectations over the Federal Reserve taking a possible break on interest rates next year pushed prices lower with the Dollar Index sinking towards a weekly low at 96.40. Although prices later recovered as trade tensions sent investors rushing to the Dollar, the upside was limited below 97.40. Price action suggests that the Dollar is likely to range ahead of the US jobs report scheduled for release on Friday. A solid NFP print for November coupled with signs of rising wage growth is seen rekindling expectations of higher US interest rates next year. Political drama in the United Kingdom has left the British pound confused and quite unsettled. Theresa May’s repeated defeats in parliament are discouraging and likely to fuel pessimism over her Brexit deal being squarely rejected next week. Market fears over the UK crashing out of the European Union with no deal in place should keep Pound bears in the game for the rest of this week. 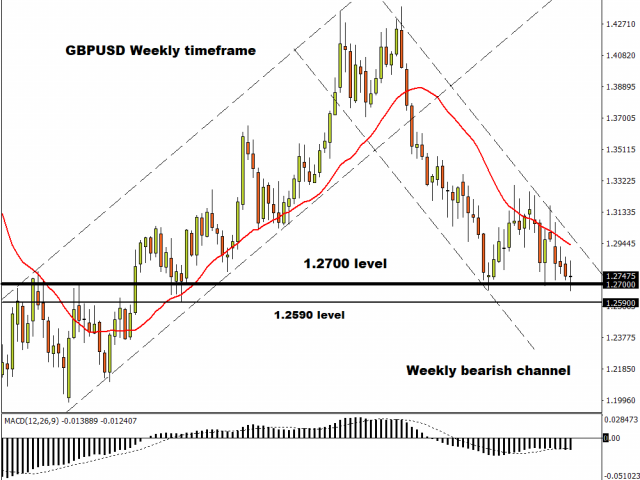 Focusing on the technical picture, the GBPUSD is certainly bearish on the weekly charts. Prices are trading below the 20 Simple Moving Average while the MACD has crossed to the downside. A solid breakdown below the 1.2700 should provide bears with enough encouragement to target 1.2590. A sheer lack of appetite for risk amid trade tensions combined with a bout of profit taking by investors has weakened the Chinese Yuan. With the Dollar potentially stabilizing on trade developments and concerns over slowing global growth, the Yuan is seen extending losses in the near term. Technical traders will be concerned with how prices behave around the 6.8500 level. Sustained weakness below this point could encourage a move lower towards 6.8317. It is fair to say that Gold’s near-term outlook hangs on the pending US jobs report scheduled for release on Friday. A solid US jobs report for November is seen reviving expectations of higher US interest rates – an outcome that will negatively impact zero-yielding Gold. In regards to the technical picture, Gold prices are bullish on the daily charts. If bulls are able to conquer the $1240 resistance level, the next key levels of interest will be found at $1248 and $1260 respectively.